Description: KCI reg. parentage sires stud & puppies for sale, extraordinary pups, and imported quality. Excellent pedigree, Proper breed characteristics broad head, heavy bone structure. We assure excellent quality of breed. Call for more information and pictures. If you would like more information you may contact us all breeds are available. Please Visit our website for other breeds details. Thank you for taking time out of your busy schedule to look at our precious puppies. Quality pup’s gives satisfaction, happiness & royalty to the owners. 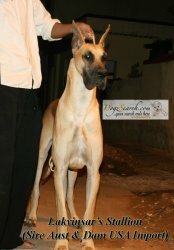 For more details contact Mr. Rao 9740000079, www.dogzsearch.Com.